Yun Gee’s work will be included as part of the Tina Keng Gallery’s inaugural exhibition, R/evolution, which opens November 1st in Taipei at their new exhibition space, TKG+. Tina wanted a title that incorporated multiple meanings, such as our history and our future. . . I came up with [R/evolution], thinking that although we are starting over, we are not a brand new gallery. We have evolved from a gallery that [has] existed for over 17 years. In Taiwan, we are surely the first gallery with such a large space. 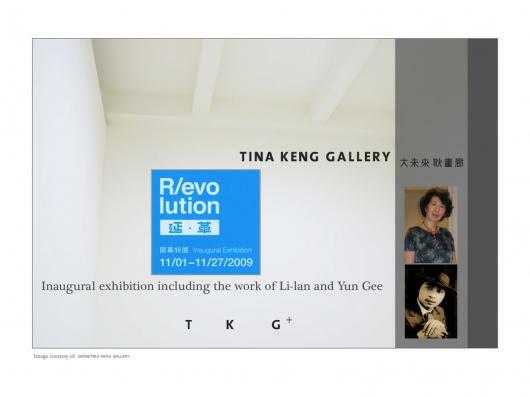 [The Tina Keng Gallery] attempts to not only revolutionize gallery space, but also the possibilities for a gallery. R/evolution includes work from Yun Gee and Li-lan.